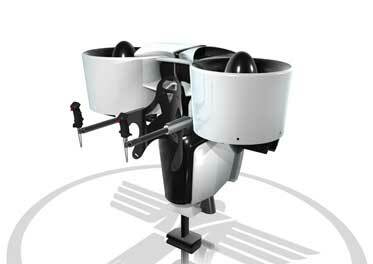 Martin Jet Pack - the ultimate personal flying machine? 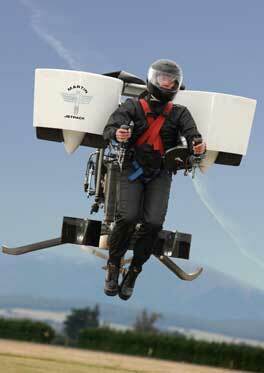 The Martin Jetpack can have you in the air, flying 100 km per hour, and getting 50 km out of its 5 gallon tank. Your own personal flying machine. Cut to New Zealand, present day, real life. New Zealand, the land of sheep, rugby and chilly bins, and crazy extreme sports where you jump off high things, and roll down large hills in big plastic balls. Or, live the jetpack dream. Inventor Glenn Martin has been in research and development on his jetpack for 30 years. In 1998 he founded the Martin Aircraft Company, with an aim of building “a jetpack that could fly 100 times longer than the 26 seconds of the Bell Rocket Belt”. The Bell was first flown in 1961, and is the device that really did popularise the jetpack in the 1960s and 70s, and even made an appearance at the 1984 Olympic Games opening ceremony. Indeed, it is the very model that appeared in Lost in Space. A thrilling concept was the Bell, but at 26 seconds the thrill passed all too quickly. In 2005 Martin built his 9th prototype, and it is this model that you can buy and fly. It was at this point that Martin achieved the target flight time, and had the device at a point at which it could be commercially built. The Jetpack has no rotors, and is designed to be torque neutral. It runs on a low vibration, V4 two stroke, 2 litre engine, giving 200 hp @ 6000 rpm – a motor developed from the ground up for the jetpack. There are two hand controls, one controlling pitch and roll, the other controlling yaw and the throttle. Safety features include a internal roll cage, a carbon kevlar hoop for side impact protection, and the structure extends below the level of the spine to prevent injury from a hard landing. Oh, and the machine has a Ballistic Parachute system, just in case of ‘catastrophic failure’. Video demonstration of the Martin Jetpack? Done. It’s a controlled indoor demonstration, I suspect the Martin Jetpack Company is still a little way off from demonstrating the jetpack at full speed in an outdoor environment. Who can fly the Martin Jetpack? First thing you need to know is that in order to buy a Martin Jetpack, you are required to complete the Martin Aircraft Company approved training program before you can pick up your wondrous new toy. Secondly, there is a body weight requirement. You must weigh more than 63.5 kg and less than 108.9 kg. Whether or not you need a licence is dependent upon regulations for ultralight aircraft in your particular country. And you have to think that if this mode of transport does take off, governments worldwide will want to be stepping upo the regulatory aspects, for reasons of safety, and of potential revenue from licences. If you’re thinking of getting a Martin Jetpack can I suggest that your research involve more from the Iron Man end of the spectrum than the Greatest American Hero. Actually, it’s a condition of purchase that you do a flying course, so you can go back to watching Iron Man as a movie instead of a documentary. Further to the paragraph above, “Who can fly the Martin Jetpack”, the first answer is, those with a good bank balance. James Bowker, the Martin Aircraft Company’s Simulation Engineer, tells me that “we estimate the initial sale price for the recreational version of the Martin Jetpack will be around US$100,000. We will be ready to take orders soon with deliveries from 2011”. You must pay a 10% deposit upfront to book your production slot, as apparently is standard in aviation circles, and then make progress payments throughout the manufacturing process. And the the time period from order time to delivery? Approximately 12 months. If I learnt nothing else from researching this, I found it incredibly interesting that the US FAA is looking at getting ready for a Blade Runner-type transporting future. Engine: Martin Aircraft 2.0 L V4 2 stroke, rated at 200 hp (150 kw). Max. 6000 rpm. Standard Equipment: Flight and engine displays, harness, ballistic parachute, retractable undercarriage, energy absorbing undercarriage. That cost and production time are unbelievable. The same thing could be made with carbon fiber and a small amount of aluminum. The v4 2 stroke is a good idea. HP/high rpm output is critical, along with low weight and engine durability. I have no idea what the weight is for your v4, but it’s likely less than 100lbs. If not, then I’d have to go with a Wankel rotary engine or some high output (+turbo) motorcycle engine. The total frame weight without pilot/engine/fuel would have to be less than 100lbs. Only carbon fiber would achieve this. And this object as made looks massively overbuilt. I don’t see where the other 250lbs would come from. If I had months of free time, a bunch of new parts, and a competent carbon fiber fabricator, I’m sure I could design a system that would cost a fraction of $100k, take only a month or so to make, and would have the same performance. You could well be right, David. That would mean that there’s room for a competitor to get in there.